The Worst Place in the World - . You can only imagine how many times I have seen my husband who is 6'9" hit his head on ceiling fans and door frames. It's amazing he's still alive and capable of normal human activity. And on small airplanes? Pure misery. Extra tallness is almost a handicap. But he can see everything. So that's a plus. 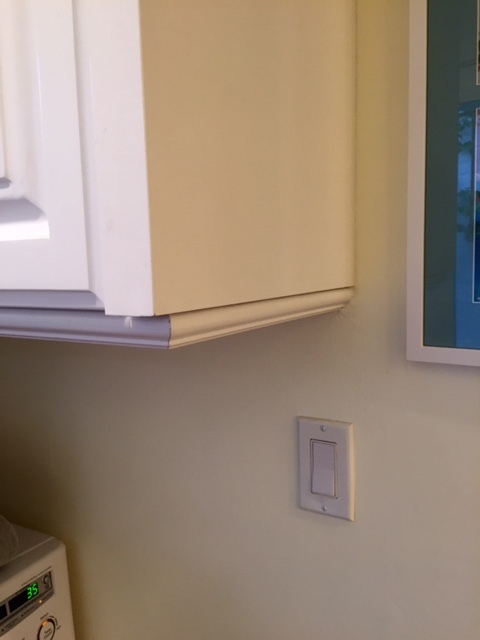 Yes, with us, it's the microwave mounted in the corner. What a dumb place for a microwave. We had a kitchen cabinet like this when I was growing up in Houston. It was RIGHT over the main counter/workspace, and my dad was the one who always got nailed. One night - at dinnertime - it happened for the last time. He went out to the garage, came back in with a saw, and - without a word - took the whole corner off the cabinet while we all stood there watching. In hindsight, I'm sure that's a metaphor for something - I'm just not sure what, exactly. Can you please order me a helmet too? I have total empathy for Mr. Rosenberg. He gets hit in the head a lot because he's tall. I get hit on the head a lot because I'm short! I'm always grabbing for stuff on high shelves (in my evil closet) that I can't reach, so they fall off and hit me. So irritating!! !